Western blot analysis of extracts of Mouse heart tissue lysate, using ABCC5 antibody. 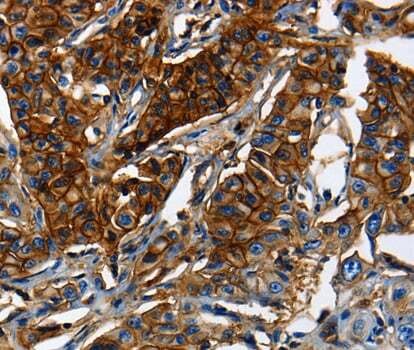 Immunohistochemistry of paraffin-embedded Human lung cancer tissue using ABCC5 antibody. The protein encoded by this gene is a member of the superfamily of ATP-binding cassette (ABC) transporters. ABC proteins transport various molecules across extra- and intra-cellular membranes. ABC genes are divided into seven distinct subfamilies (ABC1, MDR/TAP, MRP, ALD, OABP, GCN20, White). This protein is a member of the MRP subfamily which is involved in multi-drug resistance. This protein functions in the cellular export of its substrate, cyclic nucleotides. This export contributes to the degradation of phosphodiesterases and possibly an elimination pathway for cyclic nucleotides. Studies show that this protein provides resistance to thiopurine anticancer drugs, 6-mercatopurine and thioguanine, and the anti-HIV drug 9- (2-phosphonylmethoxyethyl)adenine. 1. Deletions of ABCC5 predict good tumor response to neoadjuvant chemotherapy in breast cancer.